All hype aside, Push is a fantastic tactile interface for programming. For working with MIDI in Live, Push is pretty-much unbeatable. Hugely intuitive workflow. Sleek, minimal looks. Impressive depth of control over Live. It's not an instrument, whatever Ableton might say. An Ableton Live update is always big news, but things are weird this time round, because something else is hogging the attention. 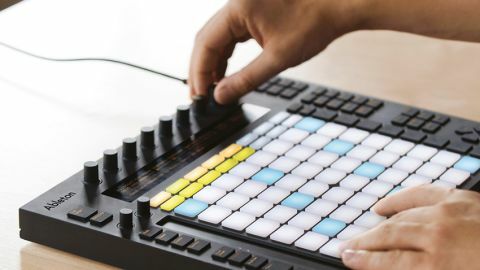 It's another Ableton product called Push - a new hardware controller for Live (or an instrument, as Ableton is insisting on calling it). This is another Ableton/Akai collaboration, but it isn't an update to their previous APC. This is a different animal altogether, with an LCD display, velocity and pressure-sensitive pads and a sleeker, minimal, and ahem, less plasticky, design. Like everybody else, we wanted to know if Push is just another controller - merely Maschine for Live - or is it truly an instrument? And can it compete with the Launchpads, APCs, and Lemurs of the world? The Push minimalism carries on to device's packaging. The box simply contains Push itself, a USB cable and a mains power supply. Also included in the price is a download of Ableton Live 9 Intro version; this is just as well because Live 9 is required to use Push. Push runs on USB power, but the power supply is in there as a just-in-case for computers that don't provide enough juice or are running on batteries and draining juice too fast. There's a power button on the back of Push along with the single USB connector and two footswitch jacks. Push looks good - low profile and like it means business. It's got a solid feel to it, weighing in at 2990g/6lbs, but stowed away in a backpack it feels fine and just within the limits of being an acceptable carry-round device. At the heart of the unit are 64 pads. There are banks of buttons on three sides, a large LCD display at the top and nine knobs rounding things off. The text on the buttons is mostly unreadable in daylight, which is peculiar. Plug in and switch on and a dialog on the LCD prompts you to start Live. Do that and a pop-up welcomes you to Push, with an option to start a new song (or not). Even now, after Launchpad, the APCs and Livid's controllers, the sight of a bunch of illuminated pads, ready and waiting, is a lovely thing. Push is supposed to work as a controller for your Live set, a drum programming device and a keyboard interface. We dived in by opening an existing Live 8 set. Press the Session button on Push and the pads light to show the colours and positions of clips in the set. Press the pads to launch clips and use the buttons at the right to launch Scenes - it's what you'd expect if you've come from using other controllers. The Shift button jumps between blocks of clips, while four navigation buttons allow track-by-track or Scene-by-Scene realignment of the view. Again, this is nothing we haven't seen on previous controllers. A combination of track- and device-selection buttons allows muting and soloing of tracks, as well as the editing of device parameters. There are, of course, transport controls, along with a tempo knob. All very nice so far. Open a new Live set, however, and things get really interesting. It's possible to add tracks, as well as browse and load devices of all types, from Push. You can add Audio, MIDI, and return tracks although, as far as Push is concerned, audio tracks aren't that important; this is a programming machine. All of which means you're going to be able to spend plenty of time not looking at your computer screen. When a drum rack is loaded Push goes into drum programming mode. It's possible to audition drum rack sounds, set loop lengths and program sequences from the pads. These pads really are touch-sensitive and you can hear it when you're adding your drum parts. A touch strip at the left of the pads navigates through drum rack pads in blocks of 16. There's also a repeat button so when a pad is held down, notes can continue to play at the interval determined by the note buttons. The illegible buttons make sense now - they're backlit when needed, so they only light when the action you're performing at the time requires it. Some buttons, such as Repeat, are active when pressed and held, but also latch when tapped and released quickly. They will stay lit if this is the case. You can also go into Record mode and record your pad hits in real time, quantising them afterwards or undoing if necessary, all from Push. When an instrument is loaded rather than a drum rack all of the Push pads are illuminated and they are ready to play, like a keyboard, with the lower left note being C1. The default scale is C major, but a tap of the Scales button lets you dial up any one of many scale types, and in any key. Again the touch sensitive pads come into play depending on your choice of instrument. In this mode, the touch strip functions as a pitchbend control. Of course, there are controls to handle keyboard recording - to restrict clip lengths, change octaves, enable automation recording, quantize, undo the last recording or even remove the entire clip. Once a few parts have been created the Session button flips back into controlling the clips, which is where we came in. The depth of control from Push is really impressive. You can argue that some of its functions can be used faster if you use your computer trackpad, but that's missing the point. Push is about creating a workflow and moving out of the box. Although Push requires Live 9 if you want full functionality it can be put into User mode, where it functions as more of an everyday MIDI controller that can be used with other versions of Live (or, indeed, any other software). There will definitely be some Max For Live and Max/MSP devices created for this! Push bridges the gap between MIDI hardware sequencing of the past and modern music software while staying mobile and flexible. The question remains, though: is Push truly an instrument? Strictly speaking, we'd say no. To us an instrument is something that makes a sound of its own without having to be plugged into a computer to make it. You'll have your own view but we think Push is still a controller - albeit one that integrates very tightly with Live. All hype aside, however, Push is a fantastic tactile interface for programming with Live and one that goes way beyond the beat-making archetype. This is a no-brainer for anybody buying into Live for the first time: there will be a new generation of Push/Live users who take the entire setup at face value and just get down to it. Seasoned users who have their own established workflows and favourite control gear may take more persuading. But there's nothing quite like Push if working with MIDI in Live is your thing; it works fantastically well.